When deciding which rope or ropes to bring on a climb, the first decision needs to be whether two ropes are necessary or if one is adequate. If your planned descent route requires no rappeling, limited rappeling, or only relative short rappels, then taking only one rope is a completely reasonable option. One must be aware though of the commitment that this creates, for descending a big, alpine face with only one rope is a very slow and tedious task, to say the very least. Using a single rope and lightweight rap/tag/haul line – Colin Haley on All Along the Watchtower on North Howser Spire, Bugaboos. Photo by Mark Westman. One of the best and most versatile rope systems is to bring a single climbing rope and a secondary rap/tag/haul line. This (along with the one rope system) is the only system to consider if you are bringing ascenders, as jugging on double or twin ropes is neither practical nor particularly safe. In addition to making jugging possible for the follower, climbing on a single rope makes rope organization simpler, is preferred for climbing particularly difficult pitches, and allows the use of mini-ascenders for simul-climbing safety. The single rope can usually be thin and lightweight, with many single rated ropes now available with diameters of 8.9 or 9.1mm. Another option is to use a rope rated as a double (AKA ‘half’) as a single, with a diameter of perhaps only 8.0-8.6mm. One should be aware that the rope simply snapping in half from a fall is nearly impossible (after all, double ropes are designed to hold falls by themselves), but the rope being cut over a sharp edge is a danger worthy of concern. 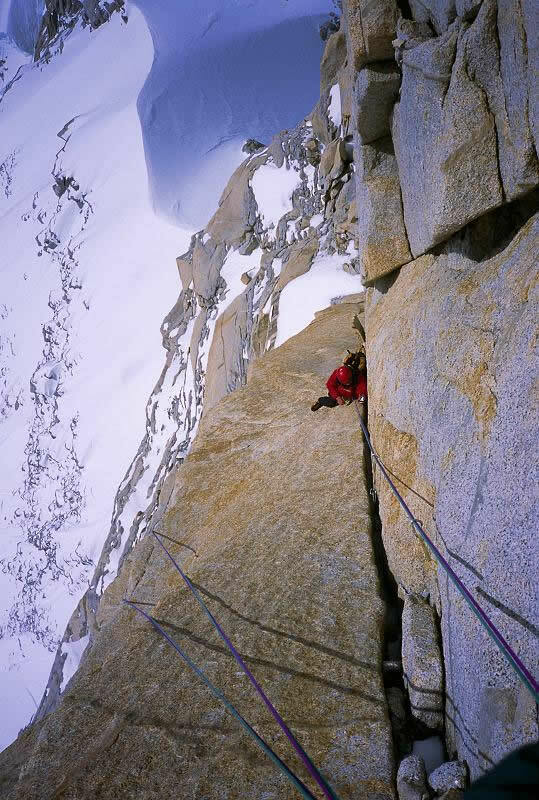 For this reason, using a double as a single is probably wiser on a route of predominantly ice-climbing than on a route of predominantly rock-climbing. If you plan on the follower jugging some or all of a route, then choose a conservative-sized single rope of more traditional diameters, such as 9.7-10.2mm. Jugging is very hard on ropes and if the rope runs over a sharp edge it can be sawed through by the motion of jugging, so it is worth the weight to bring a burly rope. The rap/tag/haul line can stay at the bottom of the follower’s pack for most routes, and then be brought out when time to make rappels. For particularly hard climbing, the leader might clip it to the back of his/her harness to haul one or both packs or to tag gear while aid climbing or short-fixing. The rap/tag/haul line might be anywhere from 5.0mm to 8.0mm (a rap/tag/haul line as thick as 8.0mm would likely be for alpine ‘big walls’ with lots of steep terrain). Ideally it should be static, very strong, and cut resistant. This means that the best rap/tag/haul lines for most climbs are 60m lengths of 5.0mm spectra-type cord, although a less expensive option (and less strong, less cut resistant, and more tanglesome) that many climbers use is just a 60m length of 6mm perlon. Rappeling with ropes of significantly different diameters requires some care, and the most important rules are: 1. The knot tying the ropes together (overhand on a bight, AKA ‘euro death knot) should be very well dressed, very tight, and made with long tails. 2. Every rappel should be set up such that the rap/tag/haul line is pulled to retrieve the ropes rather than the single rope. 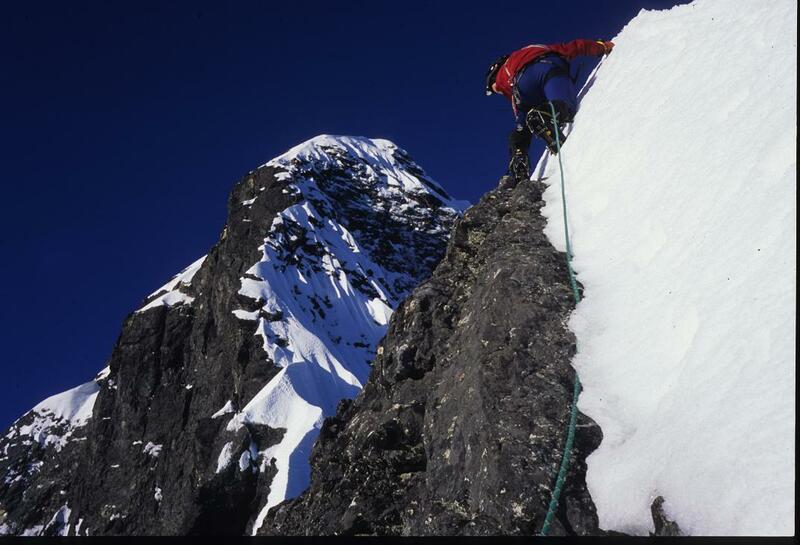 Using a half rope as a single rope – Dan Aylward on the first winter ascent of Mt. Triumph’s Northeast Ridge. Photo by Colin Haley. Twin ropes, typically with diameters of 7.5 to 8.0mm, make a very light and simple rope system for routes on which you expect no jugging and no pack hauling. The rope organization is more of a hassle than with a single rope, but much simpler than with double ropes. The biggest advantage of twin ropes over a ‘single’ + rap/tag/haul line is that rappeling with ropes of the same diameter is more hassle-free. Twin ropes are a good option for long routes that are consistently fifth-class but without aid pitches, especially if the planned descent route is the same as the ascent route, and thus a lot of rappeling is expected. Double ropes typically make for the heaviest overall rope system and the most rope organization hassle, limiting their usefulness for big alpine routes. Some would argue that using double ropes reduces rope drag, but I think that more often than not, the opposite is true. Their minor advantage over twin ropes is less impact force on your protection in the event of a fall. However, double ropes are usually the best system for climbing as a team of three because the leader climbs with both, and then can belay both followers at once as they each climb on a single strand. This does not work well with twin ropes because each rope is scarily skinny to climb on (even following) by itself, and having both ropes running through each piece of protection is problematic for two followers climbing at the same time. Hey Colin, Great post. I have a question, why do you recommend that the rappels should be set up to pull the rap/tag/haul line as opposed to the dynamic climbing rope? Thanks for your answer in advance.